My sister & I drove out into the country in my second week in Korea. Rather, by bus for three hours winter trip over mountains to Gyeongju, the burial city of the kings of Korea. It is located on the other side of the country on the coast and is really worth seeing. 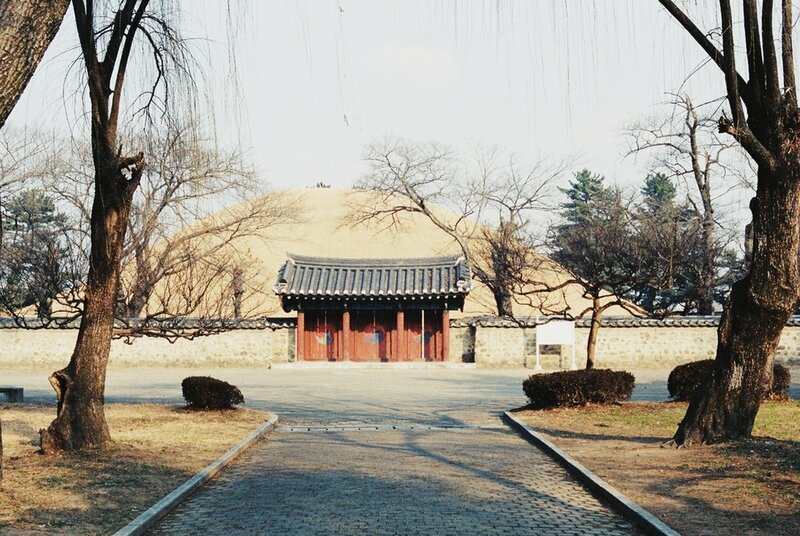 Gyeongju was once the capital of the Silla Kingdom, a dynasty of monarchs who made several hundred kings. Their burial mounds are worth seeing at the city. Similar to pyramids, the Koreans piled up burial mounds for their venerable persons - below there is a burial chamber with treasures. The hills are very sacred to Koreans. They remain untouched. In the city are more than twenty burial mounds, in which only two were ever opened because of excavations. With the treasures found there, museums were being set up. The other graves should remain undisturbed and the dead should not be disturbed. It has respect and also the open graves were closed again. The whole city, with its now extensive parks in which the burial mounds stand, is under Unesco World Heritage Site. Fully authorized. What I found very charming was that it was a small town that still retains its small town charm. Of course, there are a few motels & hotels more in the city than elsewhere - but there are still traditional markets and the locals have calmly adjusted to the tourists. It was nice to get to know Korean country idyll. And the parks are really beautiful. Often there were loudspeakers on the roads from which traditional music sounded, an interesting experience. There are monasteries and shrines throughout the city. In short: I could have photographed myself dead. But I only had a film role left over and had to save with pictures, which caused my sister to make dozens of mobile phone pictures. But here only the movie pictures. Still, the light and colors of the parks was absolutely breathtaking the morning we walked around.